Exotic flowers, beautiful women, noble elephants and soothing calmness. 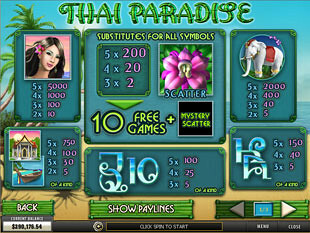 Feel the world harmony with Thai Paradise slot machine. Dive into the aquamarine ocean with plenty of gold fish to make your wishes come true and your life happier. Play this 5 reel 15 payline slot released by Playtech and enjoy relaxing tunes that transfer you into the world of sunrise. Beautiful and so tender Exotic Flower is the wild as well as scatter symbol of this game. It means that this perfect plant substitutes for other symbols to provide you with more winning combination and also can present you quite impressive cash prizes to appreciate. Just get 5 Exotic Flowers scattered on reels and multiply your total bet by 200 times. If you play with the maximum total bet of $300 you can win up to $60,000 per spin. 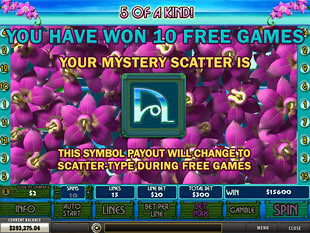 Purple Exotic Flower also can present you the bonus feature of this slot. To visit this splendid land of everlasting summer with happiness in the air you need to choose among various coin sizes that vary from $0.01 to $2.00. This penny slot allows you to cover all 15 lines with the minimum bet of $0.15. If you want to get the opportunity to get the best prizes of this slot machine, you can play with the maximum bet of $300. To win the top jackpot of 5,000 coins and convert them into $100,000 you need to play with 10 coins per line and catch 5 Thai Girls on the payline. And of course, you should play with the maximum coin size of $2.00. Just win your paradise jackpot to make some of your dreams come true. 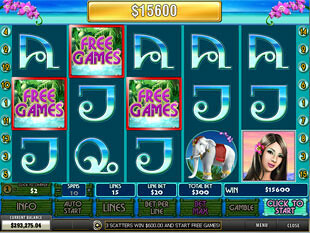 To activate 10 Free Spins you need to get three or more Exotic Flowers on the reels. This time you will also have a mystery scatter. This symbol is chosen at random and has its special prizes to surprise you. Free Spins feature can be retriggered. When you catch some winning combination on the payline and win some prize you can double or even quadruple your award. Just activate Gamble Feature clicking Gamble button after any winning spin. Now you need to choose the right card color. It can be red or black. Yes or no. Dark and light. Just make your choice to win more or lose everything. When the limit of $2,000 is reached you return to the main game. Thai Paradise slot is like a fairy tail with its princesses and plenty of surprises. Enjoy ocean splashing behind you with all its best awards guaranteed. Just play with joy to feel pure happiness.